Are you ready for an adventure? If so, then the Mini Adventure bag is ready when you are!! Hand crafted from a beautiful piece of 4-5 oz drum oil dyed leather the Mini Adventure bag is up for what ever adventure you throw at it. A perfect size for some cash, a credit card or two and your favorite lip stick! 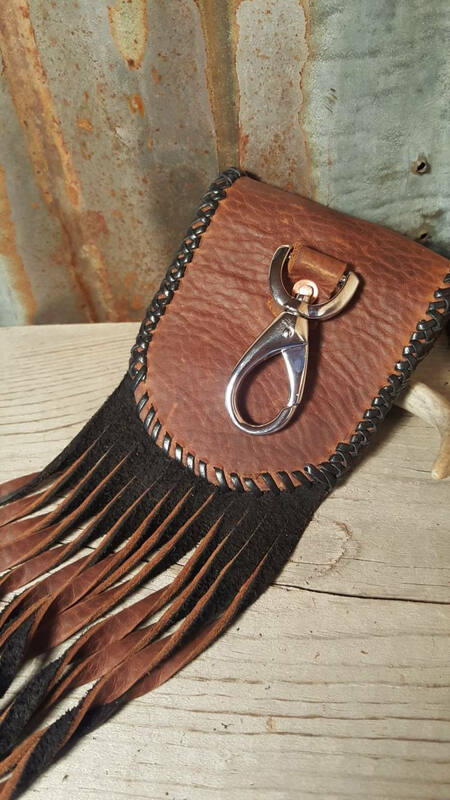 This little bag will help you be hands free in style!! 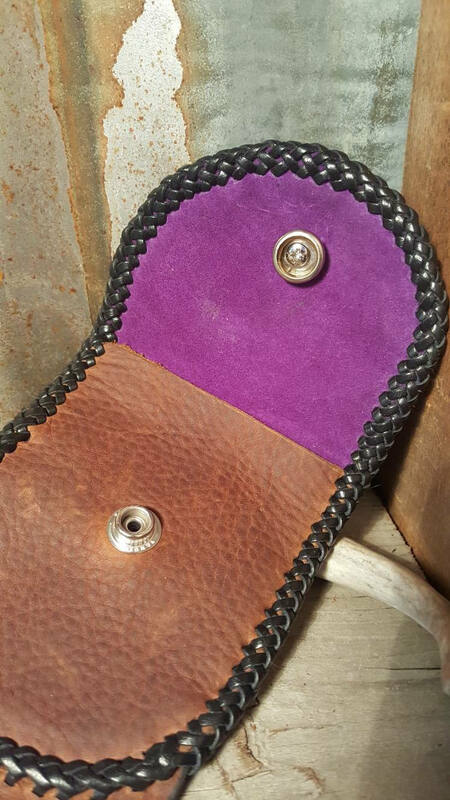 The inside starts with a lining of RFID paper that has been covered in a deep purple pig skin suede. The RFID paper helps protect your credit cards from ID theft. 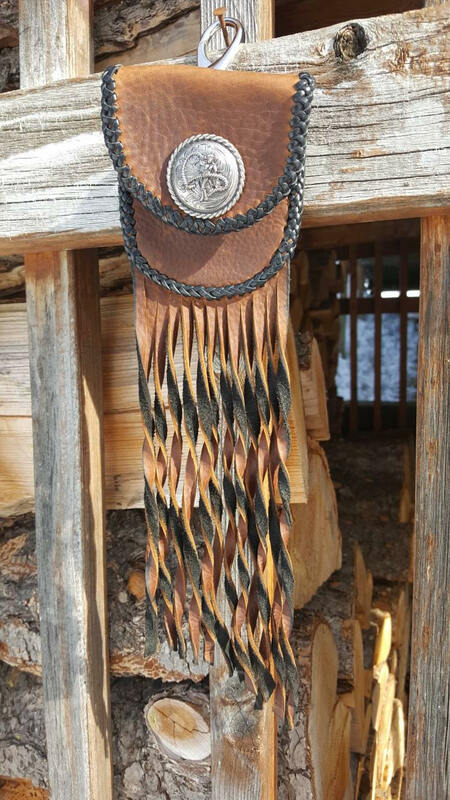 The back of the bag features a flat arch style clip that can easily go from your belt loop, to your back back or even your saddle. 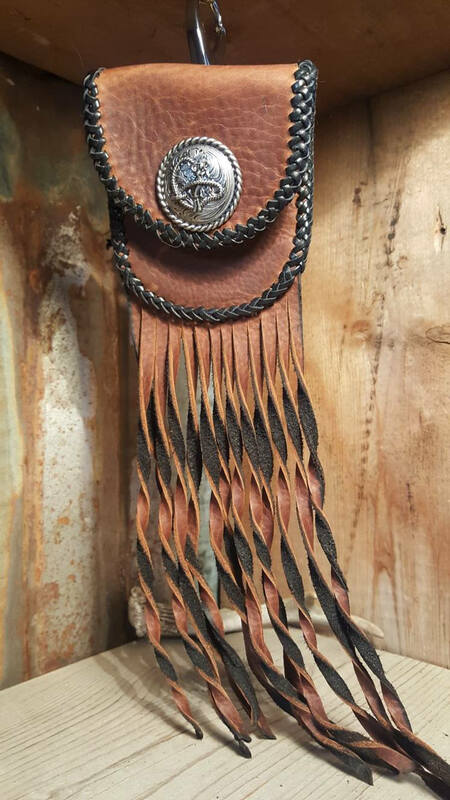 The front of the bag features a large antiqued concho with a sassy ropin' cowgirl snap. To help give this bag style that will stand out in a crowd, the entire edge of the bag has been laced in the round braid style with inlay lacing over the fringe. 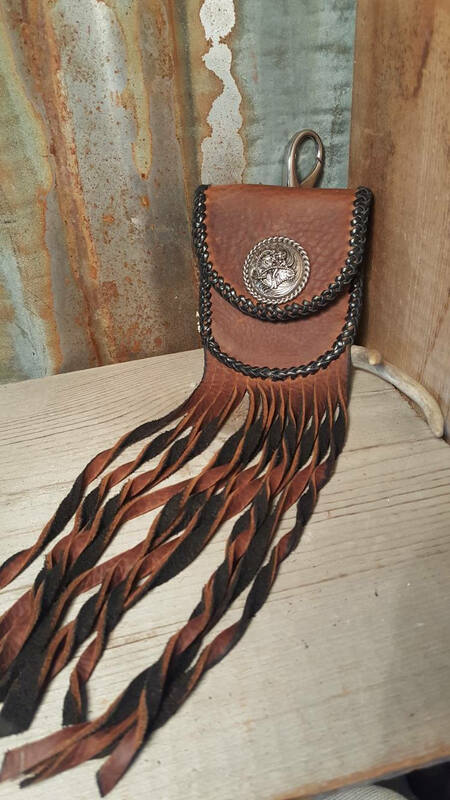 And speaking of fringe.....the 10 inches of sass is sure to match your sassy style! Each piece of fringe is moistened, twisted then allowed to dry. 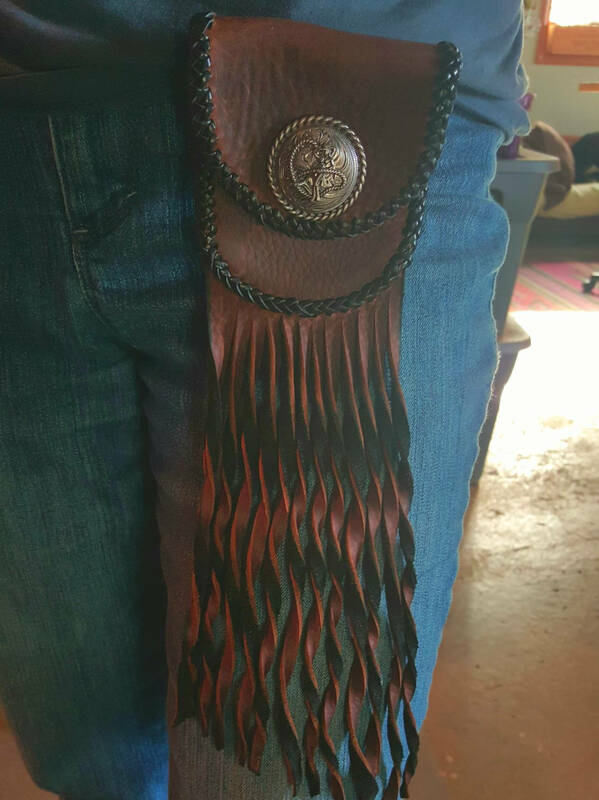 The back of the leather has been dyed black to give it some serious street cred to the look!! Each of my Mini Adventure bags takes approximately 3-4 hours to create and includes almost 13 feet of premium calf skin lace. All work is done by hand!! No really....it's all by hand!! The bag measures 4 inches wide, 4 inches tall. 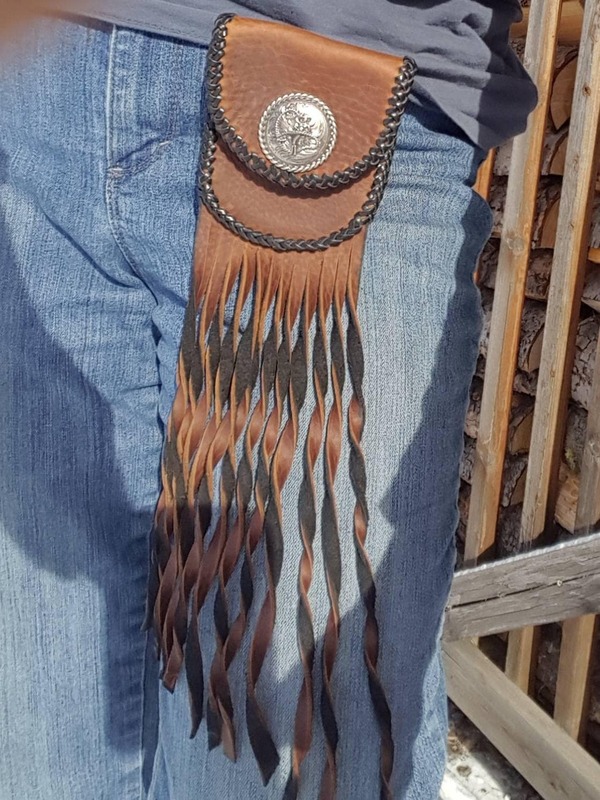 I do have a wide variety of conchos available so if this sassy cow girl doesn't float your boat send me a convo to inquire about all available options. Copyright 2014-2018 Dirty Name Ranch, home of The Bucking Mare.